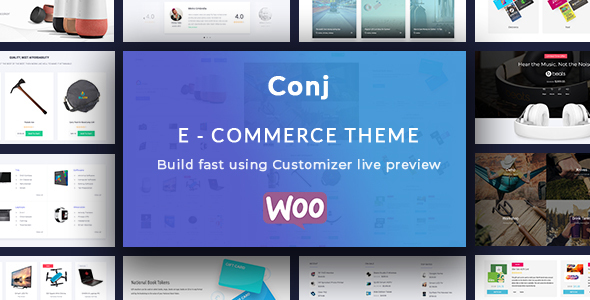 Get started with Conj which is the one thing you need to build your own stunning eCommerce website in a fast and efficient way. The entire platform of Conj is built on top of the Underscores starter theme which is a solid foundation of code and also used for all themes released by Automattic on WordPress.com. Get the one thing you need to build stunning eCommerce website in a fast and efficient way. Jetpack by WordPress.com — Hassle-free design, marketing, and security — all in one place. WooCommerce Variation Swatches and Photos — Allows you to show colors and photos as an alternative to dropdowns for variations of variable products. MailChimp for WordPress — Helps you grow your MailChimp lists and write better newsletters through various methods. Due to copyright restrictions, all images downloaded via demo import are pixelated and their quality reduced on purpose.